Deep Dive – Overcoming the Five Dysfunctions of a Team - CUE, Inc.
We’re very excited to be able to offer a unique post-conference workshop for CUE members at our upcoming conference in Orlando. Shelly Setzer, Principal Consultant at The Table Group will be our opening speaker on Tuesday morning reviewing the basic model from the best-selling book, “The Five Dysfunctions of a Team” in a general session for all conference attendees. She will also be offering a 3-hour deeper dive into the subject at a special post conference workshop on Wednesday, May 18th. Shelly brings over 15 years of business and leadership experience to her role as a Principal Consultant at The Table Group. Her marketing and management experience at both large and small high-tech companies enables her to draw from real-world examples to apply to her client engagements. Currently, Shelly works with CEOs and executive teams in effectively applying the concepts captured in all of Patrick Lencioni’s books. Her consulting approach is informed by her years of achieving results with a variety of teams and environments – including matrixed, virtual and functional. Companies that are organizationally healthy get more done in less time. They avoid losing their best people. They identify problems earlier and solve them faster. They beat rivals who waste time, money and energy fighting among themselves, which ultimately drives away good employees and customers. 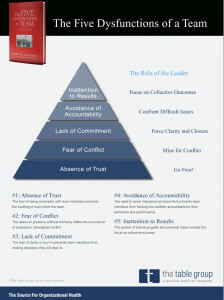 In this workshop based on Patrick Lencioni’s bestseller, The Five Dysfunctions of a Team, Shelly Setzer will dive deep into the root causes of politics and dysfunction on the teams where you work, and the keys to overcoming them.